Ocala, Florida — On Sunday, December 14, 2014, at approximately 10:30 p.m, Ocala Police responded to a report of a carjacking incident that had just occurred at Olive Garden, 3363 SW College Road. The suspects took the victim’s money and got into his car. Before driving away, they shot him in the shoulder with their weapons, which turned out to be pellet guns. A description of the vehicle and suspects was issued. A short time later, the vehicle was spotted by Officer Emmanuel Ramjit on SW 27th Avenue, just north of SW College Road. The vehicle turned into Steeplechase Apartments, 1421 SW 27th Avenue, at which time the driver and passenger fled on foot. The driver, later identified as Wendell Curcio, 16, ran a short distance before surrendering. The passenger was located at Blitchton Station Apartments, 1741 NW 7th Street, and was identified as Kevin Charbonier, 14. 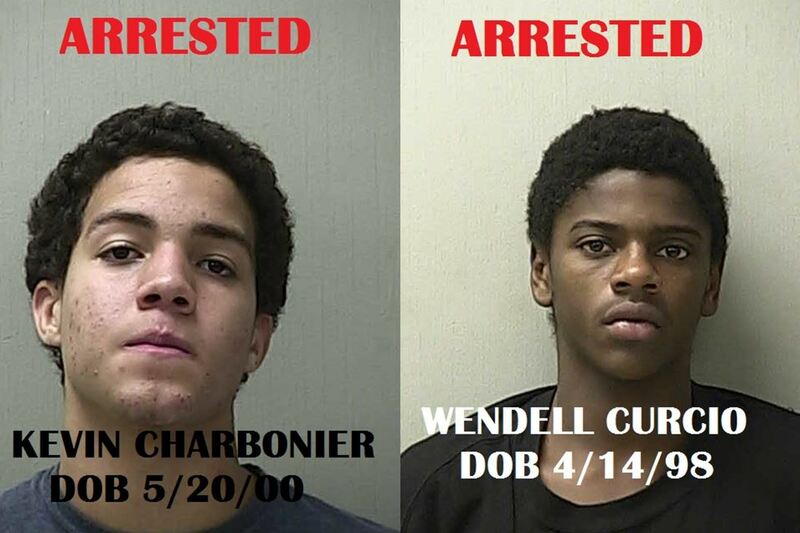 Both were interviewed at the Ocala Police Department by Detective Matthew Steckman and Sgt. R. Jason Douglas. During the interview, Curcioa and Charbonier confessed to the incident. Earlier on this same evening, at approximately 6:30 p.m., there had been a report of an attempted carjacking at La Cuisine Restaurant, located at 48 SW 1st Avenue. The victim advised that she had been sitting inside of her 2007 Toyota Camry when two black males with guns opened the doors of her car and ordered her out. As she tried to call 911 from her cell phone, one of the subjects slapped the phone out of her hand and then both suspects ran off. Curcio and Charbonier also confessed to having committed this crime. Additionally, Curcio and Charbonier advised to having been the two suspects who robbed and attempted to steal a 2014 Toyota Corolla from a victim near the Ocala Ice Rink, at the corner of SE Fort King St. & SE Osceola Avenue on December 10. Both advised that neither one of them had been able to drive the standard shift car, so had walked away with the victim’s wallet, cell phone, and cup holder of change. Charbonier took officers to where he had stashed the wallet and it was recovered. Curcio and Charbonier were also identified as the suspects who stole a 1990 Chevrolet pickup truck from the front yard of a residence in SW Ocala. They advised to having driven the truck to Wildwood and back; leaving it abandoned on the side of I-75, where it was recovered by FHP. Lastly, Curcio and Charbonier were also identified as the suspects who committed an auto burglary at the Olive Garden on the same evening as they committed the carjacking. The window of a 2002 Chevrolet Malibu had been broken out and the victim’s purse was taken from the floorboard. Both suspects advised that they had broken into this car, but advised there was nothing of value to take. In total, Curio and Charbonier were charged with 5 Felony charges each: 2 Counts of Carjacking; 1 Count of Auto Theft; 1 Count of Robbery w/a Weapon; and 1 County of Auto Burglary. They are now being held at the Marion County Jail. It is unclear where the teen’s parents were during their crime spree.